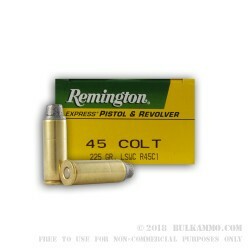 This .45 Colt ammunition from Remington is a great target shooting load for guns like the Single Action Army, Taurus Judge, or S&W Governor as well as a variety of carbines. 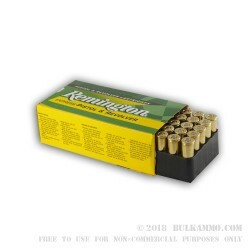 Each cartridge in this box of 50 fires a 225 grain lead semi-wadcutter bullet with a muzzle velocity of 960 feet per second and a flat head ideal for punching nice, visible holes in paper targets. The flat projectile also lends itself well to feeding in tubular magazines. 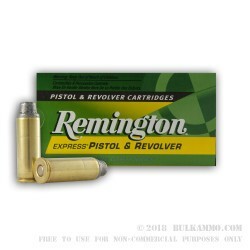 These cartridges are loaded by Remington in Lonoke, Arkansas using non-corrosive Boxer primers and brass cases. They use coated lead bullets that may not be permitted at all ranges, particularly indoor ones, so check before ordering if you're unsure.